Helen Grace has been dedicated to Revelstoke for almost 90 years. Sep. 30, 2016 6:00 a.m.
Helen Grace at a Royal Tea on the occasion of the wedding of Prince William and Kate Middleton. “Any organization, I was secretary or president, or both,” she told me. Grace is a born-and-raised Revelstokian who can trace her family roots here to 1896, when her grandparents migrated here from Ontario. They came when her grandfather, Thomas Bradshaw, got a job as a freight agent for CP Rail. Her mother was born here in 1898 and she Helen came into the world in 1927. She turns 90 in January, but she celebrated this past weekend, when the weather was nice. She had 24 family members show up, all the way down to her great-grandchildren. “I would chat away and ask them, do they have a little girl, where they were from and where they were going,” she recalled. She spent most of her childhood here, except for a two year stint from 1934 to 1936 when her father had to take a job in Cranbrook because there wasn’t enough work on the railway in Revelstoke. During those two years, they rented out their house for $25 per month. She attended school at Selkirk Elementary on Sixth Street, where the Selkirk Gardens seniors condos now stand. She went to church and attended Sunday school. “Revelstoke was a great place to grow up in, even in the 30s,” she said. Grace began her involvement in community life in grade seven, when she joined the Junior Red Cross. In high school at Mountain View (which later became an elementary school and is now slated to be a distillery, restaurant and medical clinic) she was part of the newspaper club, outdoors club, cheerleading team (there was two of them) and the YMCA Leader Corp. But her main passion was the drama club. Their biggest production was the musical In Old Kentucky Gardens, based on the music of mid-19th century American songwriter Stephen Foster. She played the lead role, a girl named Jeannie. “We had a wonderful time,” Grace said. Her school was small, and got smaller as boys were called off to fight in the Second World War. By the time she graduated, there was 21 girls and nine boys in her class. “When we had dances, the girls had to dance with each other,” she said. After high school, Grace went to nursing college at Columbian Hospital in New Westminster. One September, on a trip home for her father’s second wedding, she was told about a local youth named Gary Grace. She found out he was at the movie theatre, so she and a friend ran over and left a note on his car. “If you’re interested in a party and a pretty girl, phone 273,” she recalls writing. He responded, came over and that was it. “It was understood by the end of October, before I left to go back to New Westminster, that we were going to get married,” she said. Grace spent a year as a nurse in New Wetsminster before moving back to work at Queen Victoria Hospital, which was located where Save-On-Foods is now. In September 1950, she and Gary got married. They stayed married until he passed away in 2011. She worked at QVH for a year before having her first son, Bill, in December 1951. Bob followed in March 1954 and Tom was the last, in 1961. While she stopped working, she remained active in the community. She was part of the Revelstoke Legion’s Ladies Auxiliary, where she still serves as the Sergeant at Arms and has lead the Colour Guard at the Remembrance Day ceremonies the past two years. “I was a Legion baby. My husband was in legion, as was his brother and as was our eldest son,” she said. She was a member of the Revelstoke Nurses Association for 40 years, and active with the St. Peter’s Anglican Church. She was the first People’s Warden of the church in Revelstoke and when she attended the regional church conference in Vernon, she and the other warden from Revelstoke were the only two women there. She was involved with every sports club her kids took part in, notably baseball, where she was the head scorekeeper, and the ski club, where she helped organize tournaments. She also golfed and played curling. Most notably, she might be known for her work with the Revelstoke Museum & Archives. 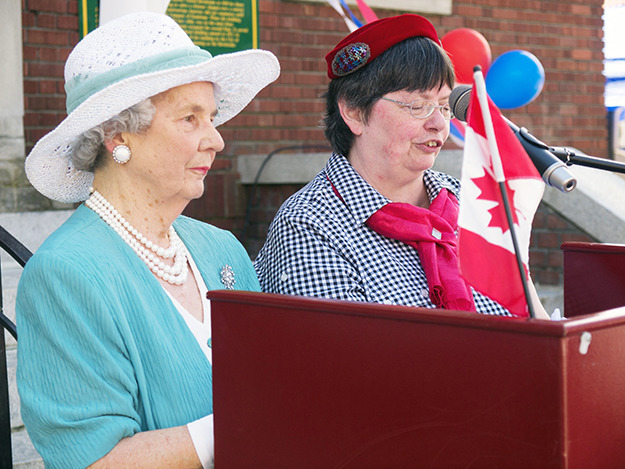 She was president for 12 years and helped organize the city’s centennial celebration. She often appears dressed up as Queen Elizabeth II at ceremonies. For Grace, her community involvement was a fact of life growing up here. Revelstoke was more isolated then, especially in winter, so community groups thrived. “You could belong to a dozen of them around town,” she said. Gary died in 2011 and she still lives at the home on Ford Street. Their names are carved in an engraving on the front door.